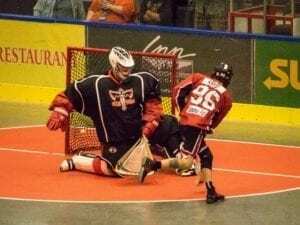 Day one of the Canadian Senior ‘B’ Championships has been an amazing display of culture, tradition and the very top echelon of box lacrosse. The tournament, simply known as the President’s Cup, is a tradition that spans more than half a century. Eight teams from across Canada and the First Nations will do battle over this next week, with a single champion being crowned on Sunday, September 2. Before any of the games kicked off, the First Nations people of the island had a ceremonious welcome for representatives from all eight teams. The Snuneymuxw (Snuh-name-oo) granted permission to two traditional canoes carrying all eight representatives to come ashore. These two sentences don’t do half the justice to how simply impressive this ceremony was – I had yet to see any lacrosse at the tournament, but it might very well stand to be one of the most memorable experiences I’ll have. This island and the people who have inhabited it since long before first contact have a deep love and appreciation for their home – and while the history of lacrosse in Nanaimo is slightly less extensive, the love and appreciation for tradition and a history of competing and “doing battle with good intentions” runs very deep. The larger opening ceremony that would take place later in the day featured the 1966 and 1969 President’s Cup Champions, the Nanaimo Luckies. 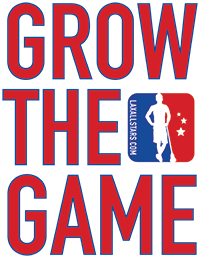 Generations of lacrosse players were on hand to appreciate the forefathers of lacrosse on the island and their tradition of winning, as well as celebrate the beginnings of these games. Above is a ceremonial face-off between Nanaimo and Caughnawaga. 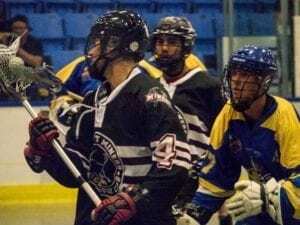 Nanaimo player Corey Shires faces off with his grandather behind him, while Jamie McCumber faces off for Caughnawaga with his father Dirt behind him. 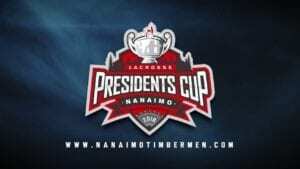 The two families were opponents fifty years ago in the 1969 President’s Cup final when Nanaimo last won gold. Short runs by the Axemen from time to time kept the game interesting, but Ladner was clearly the dominant team and that was never disputed from the first whistle to the last. The local boys from the mainland made a solid statement with this first win. The first game of the day is often hard, but the first game of the tournament is another thing entirely. The bar was set pretty high, and if this game was any indicator – we’re in for a great week. The game was at one point tied at three deep in the first period. The Miners notched the next goal, and never looked back. The Brew Crew did have the a cohesive offense capable of scoring, but Aaron Bold refused to give up any of the two-dozen attempts at the five-hole. Everyone was expecting a good game, but I’m not sure how many people were expecting this result. Nanaimo really looked like they had an offense that was more organized – leading one to think that would be the winning ticket. Caughnawaga’s Brandon Miller had the answer in net to dozens of Nanaimo shots. 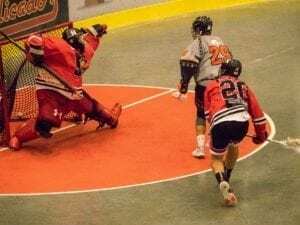 Smart finishes from Blaze Riorden and Ty Thompson taking advantage in broken situations lifted Caughnawaga to a critical first-game win. Scoring on both ends was prominent in broken situations, leading to arguably the most exciting game of the night. Constant pressure and dominant ball control were Onondaga’s strengths, while absolutely lights-out goaltending and youthful athleticism allowed Oakville to take advantage of transition play and they Ontario boys stuck the shots when they counted.